I wanted to write you and let you know how incredibly happy I was with the ice sculpture Ice Visions created for our wedding on May 17th. It was absolutely beautiful and went perfect with our candy table! I was actually a bit worried because we had to set up the candy table the night before so everything was set in place. I was scared that everything would get moved while putting the ice sculpture on the table. Your team did an amazing job with this and did not disturb a single thing! I was extremely happy with your customer service from start to finish. If there is any specific place I can write a review for you, please let me know. I would love to let everyone know how wonderful Ice Visions was to work with. Also, I would be happy to send a picture once I get one of the entire table and sculpture together! "We first saw your Circle of Love at a Bridal Show. It was beautiful and impressive... I called a few days later and was surprised at how warm and helpful your staff was over the telephone.. The most amazing part was the final product!! Circle of Love was even more beautiful than we remembered and added such an amazing effect at the reception! Our guests are still raving at how awesome it was! THANK YOU for having a great staff, both the ones that deal with the public AND the artisans that create the magic behind the scenes! It was a pleasure to deal with your company. I wish all of the vendors we employed for the wedding had your same professionalism, passion, and competence. Thank you, too, for making me look so good and delighting our guests, too!" "Brilliant Work! It was a pleasure as always. Thank you for everything." Mary Allison – Parties & Props, Ltd.
"As you know, The Bank held a reception attended by over 200 of our major clients and vendors. 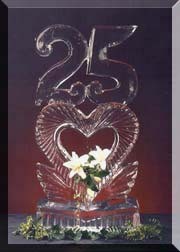 We have received numerous complimentary reviews from our clients and officers on the design and elegance of your ice carving." "Just wanted to say thank you. 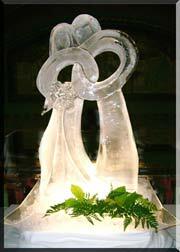 Our ice sculpture was more perfect than we could have expected..."
Vicki Lloyd – Banquet Manager – The Banquet Center Inc.
"Ice Vision's Sculpture almost stole the show at our wedding reception!!! The oversized sculpture of our new initials was perfect!! It was set up at the entrance to the reception hall, and greeted everyone as they walked in. We loved it!!!!!!!!! "Steve and I had to thank you for an absolutely beautiful job you did on our Oct. 19th wedding!! Thanks for everything and making our wedding a perfect fairytale!" "Thank you for providing a beautiful centerpiece for our reception. The Double-Dolphins looked spectacular. I think every guest took a photo..."
"The most exciting thing about our Anniversary party has to be that gorgeous ice carving... People may forget everything else about that evening but they will never forget that ice sculpture..."
"Let me extend my sincere appreciation to you for your participation in the Southeast Missouri University Foundation Dinner. 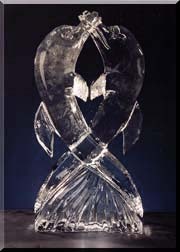 You ice sculptures received rave reviews from all the guests." Albert E. Phillips, – President – Design Alliance, Inc. Follow us on Facebook for new photos, reviews and more!